When the power goes out, a portable generator can supply your home with electricity. Here’s everything you need to know to operate your generator safely. While a portable generator might cost several hundred or even thousands of dollars depending on size and model, it’s bound to be less expensive than a permanently installed standby generator, which would kick on automatically to power your home. Plus, you may not need a professional electrician to install a portable generator, and you can easily take the unit with you should you move. All that said, proper operation of the device is crucial to ensure the safety of your family and your community. 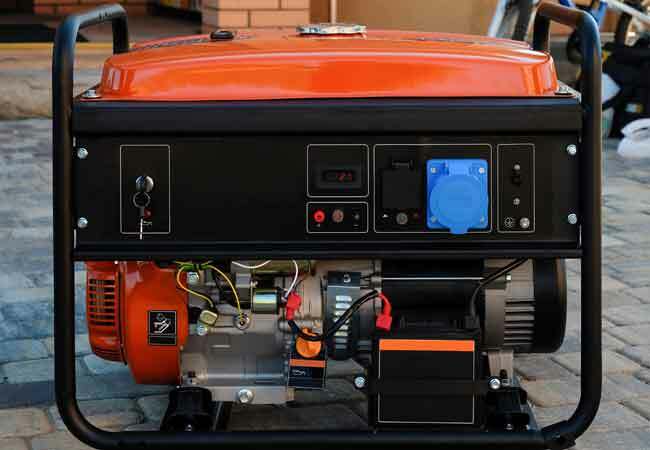 Read on to learn the how to use a generator carefully and correctly. There are two “musts”—a “do” and a “don’t”—to ascribe to before you begin to use a generator. DO carefully and completely read and understand the owner’s manual for your unit. You need to learn about any special procedures or precautions for your specific model. DON’T “back feed” your portable generator under any circumstances. Back feed refers to plugging the portable device into an outlet in your home with a special extension cord in order to feed electricity from the generator into the entire home. This illegal practice can be deadly. It causes a risk of electrical fire to not only your home but any home serviced by the same transformer; in addition, it can kill utility workers working on the power lines. If you want to connect a generator to your home, you need a licensed electrician to install a transfer switch according to local codes. STEP 1: Locate the generator a safe distance from your home. • …locate a portable generator outside, at least 20 feet away from your home (and your neighbor’s homes). • …allow at least five feet of clearance in every direction, including above the unit. • …do not place a portable generator in any enclosed or partially enclosed area, such as a garage, basement, attic, shed, or crawlspace. • …do not leave generators near open windows, doors, or vents, which could allow carbon monoxide to enter your home. • …have carbon monoxide detectors located throughout your home, on every floor, outside sleeping areas and other central spaces. • …aim the exhaust away from occupied areas and in a position where it blows downwind, away from your home or your neighbor’s homes. STEP 2: Check the fuel and oil levels. Make sure you have a full tank of fuel before getting started. Your generator should have a fuel gauge to make it easy to check, but the unit must be on a level surface to obtain accurate results. If you need to add fuel, consult your owner’s manual for fuel recommendations. Next, check the oil level, which will likely be similar to checking the oil in your car. Locate the oil dipstick (often below a removable maintenance panel). Pull out the dipstick, wipe it off, and then re-insert it. Carefully pull the dipstick straight out once more, then look to see if the oil on the stick falls between the lower and upper limit marks imprinted on the dipstick. Add or change the oil if necessary, referring to your owner’s manual for how to add, what kind to use, and how frequently it needs to be changed. STEP 3: Calculate the wattage requirements. Before plugging in, ensure that you won’t overload the generator by connecting more appliances and lights than it is rated to handle. Add up the starting and running wattage of the appliances you want to power simultaneously; refer to their respective user manuals or check the backs or sides of the machines to find this information. The total number should not exceed the wattage limitations of your generator—check your user’s manual if you’re unsure of how many watts of power your generator can handle. Stagger the use of appliances if necessary to prevent overloading the generator. STEP 4: Power on the machine, and plug in appliances. Follow your user manual for instructions on turning on the machine. You typically will need to turn the circuit breaker off and turn the fuel valve on before starting it up. Give the machine a few minutes to warm up, then flip the circuit breaker on. Use long, heavy-duty extension cords made for outdoor use to connect appliances to the generator one by one so as not to overload it. Examine cords before use to ensure they are in good condition with no rips or tears. The cord’s wattage rating should be greater than the wattage of what you’ve plugged into it. STEP 5: Unplug appliances and power down the generator. To shut down the generator, turn off or disconnect the appliances plugged into it. Then refer to your user’s manual to power down the generator—typically you’ll need to turn the circuit breaker, engine switch, and fuel valve to the “off” position. Wait until the generator is completely cooled down before storing it once power is restored. If you don’t anticipate needing it again for more than a month, drain the fuel and carburetor—leaving old fuel can damage the generator’s internal parts. Refer to your owner’s manual for storage instructions. 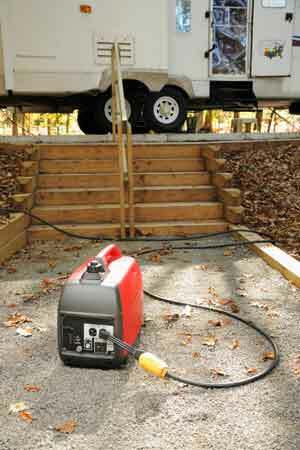 When using a portable generator, safety is the name of the game. Keep these things in mind before, during, and after use. • Generators should be kept dry during use to avoid electrocution, so as tempting as it can be to get your power up and running when a storm knocks it out, wait for the weather to stabilize. Do not use your portable generator in rainy or wet conditions and do not touch the unit with wet hands. • If a carbon monoxide alarm sounds, immediately get to fresh air outdoors or through an open window and call emergency personnel for help. Do not attempt to turn off the generator. 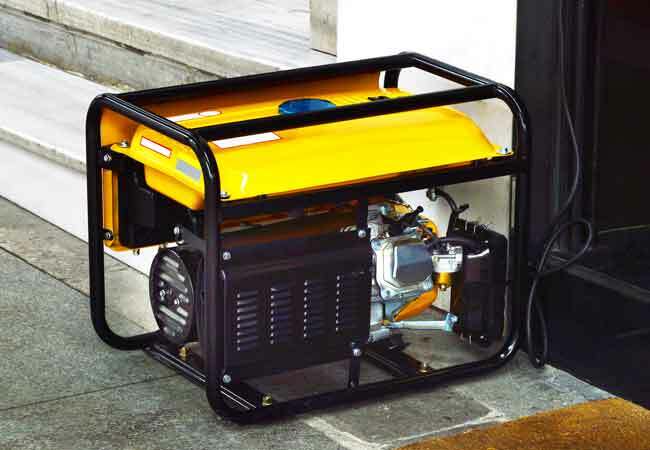 • If you need to add more gasoline to the generator’s tank, turn it off and let it cool completely before refueling. Gasoline could ignite if it is inadvertently spilled on the engine while it’s still hot.